Hewlett-Packard on Tuesday said it would release a 4G TouchPad tablet with upgraded hardware, which will be available with AT&T’s wireless network. HP’s TouchPad tablet went on sale two weeks ago. The tablet will have a 1.5GHz processor, which is a change from the dual-core 1.2GHz Qualcomm Snapdragon processor available with older Wi-Fi-only TouchPad models that went on sale just two weeks ago. HP did not immediately respond to request for comment if the new processor is a dual-core chip. However, last August Qualcomm said that by the start of this year it would ship the dual-core Snapdragon QSD8672 chip that could run at clock speeds of up to 1.5GHz. The TouchPad will have 32GB of internal storage, GPS and built-in AT&T wireless mobile broadband capabilities, HP said in a statement. Specific pricing and availability will be announced at a later date. Wireless connectivity will be available through AT&T’s DataConnect mobile data plans for tablets or Wi-Fi hotspots around the country, HP said. TouchPad users have expressed concerns about the device’s performance, especially the long load times for some applications. HP attributes the performance issue to software problems and said it will deliver an over-the-air software update that should resolve some performance problems. Some buyers also were concerned about the TouchPad’s weight of about 1.6 pounds (740 grams), which is heavier than Apple’s iPad at 1.32 pounds. 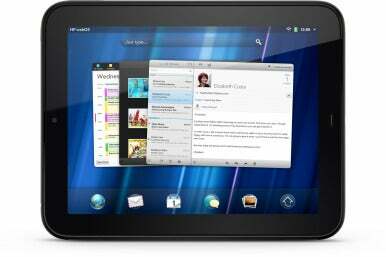 The TouchPad includes a 9.7-inch screen and comes with WebOS 3.0, which is also used in smartphones. Hewlett-Packard is trying to push the adoption of WebOS and on Monday announced new leadership to oversee the product’s development. Stephen DeWitt was named senior vice president and general manager of the webOS global business unit, which had been the Palm unit. DeWitt replaced Jon Rubinstein, who formerly oversaw Palm operations at HP and was moved to senior vice president for product innovation in HP’s Personal Systems Group.